Amarilis Dueñas Castán (Valladolid, March 28th 1998) began with her musical studies at the age of three. At five, she started with cello playing. At the age of 16, she obtained the Cello Professional Music Title and at two years later she obtained the Viola da Gamba Professional Music Title in Salamanca. Currently, she studies with Maria Kliegel and Rainer Zipperling at the Hochschule für Musik und Tanz aus Köln (Cologne, Germany). She has participated in different performances (with her three instruments) in countries such as Spain, Portugal, Italy, Germany, Austria, Norway, Sweden and Algeria. Some of her latest performances were in Trondheim, at the Olavsfestdagene and at the Palacio Real del Pardo and Teatro Carlos III in the Palacio Real de Aranjuez, organised by Patrimonio Nacional in Spain. In 2008 she won the first prize at the contest Ruperto Chapí in Villena (in the mode of Elementary Level) and two months later she won the first prize at the XI Encuentro de Intérpretes Noveles Villa de Sahagún (for people under 17). That year she began her studies with Javier Aguirre, her former teacher, and met international soloist Maria Kliegel, who has since then become her master. She has also worked with teachers such as Ángel Luis Quintana, David Apellániz, Israel Fausto Martínez, Asier Polo, Damián Martínez, José Enrique Bouché, Miguel Jiménez, Aldo Mata, Jordi Creus, Montse Aldomá, Marius Díaz, Beatriz Blanco, Guillermo Pastrana, Peter Bruns, Roel Dieltiens, Monique Heidema and María de Macedo. In 2010 she won the first prize in the Primer Concurso de Interpretación Claudio Prieto (solo mode). In April 2014, Amarilis Dueñas Castán was awarded at the Jeunesse Musicales Competition of Spain obtaining the Special Jury Mention. During the summer of 2014, she made her debut as soloist with the Joven Orquesta Sinfónica Punta del Este. Since 2012, Amarilis Dueñas Castán has also explored the world of early music considering the historical interpretation criteria with historical instruments. In that year she received the first prize at the "Segundo Concurso de Jovens Intérpretes de Música Antiga Conde Oeiras" (Lisbon, Portugal). Her teacher of baroque cello and viola da gamba (at Conservatorio Profesional de Música de Salamanca) is Javier Aguirre, well known within both instruments. She has also received lessons from teachers such as Jordi Savall, Lucia Swarts, Jaap Ter Linden and Bruno Cocset; and also from musicians of other instruments such as Emma Kirkby, Bernhard Forck and Gottfired von der Goltz. Regularly, she receives lessons from Kristin von der Goltz and Ketil Haugsand. She made her debut as a baroque cello soloist in Portugal with the portuguese orchestra "Concerto Ibérico" in June 2014. 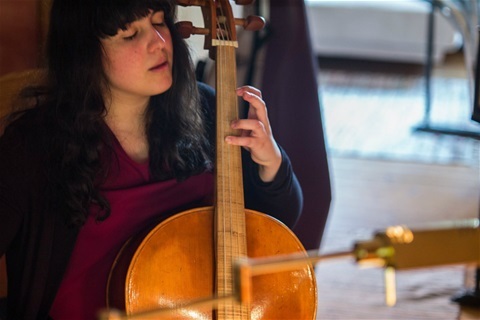 In April 2015, she played the complete set of Vivaldi's Cello Sonatas with a Galram cello from 1769 at the Music Museum of Portugal. In July 2018 she played Buxtehude's Membra Jesu Nostri at the Olavsfestdagene in Trondheim, Norway. Since 2016, Amarilis Dueñas plays regularly with the baroque orchestra "Bach Collegium Salamanca" within the project Bach Studium, which is conceived for the divulgation of J.S. Bach's cantatas in the city of Salamanca (Spain). Amarilis Dueñas is took part of Proyecto MusaE between 2015 & 2017 and since summer 2015, she collaborates with Spanish musician Amancio Prada in some of his performances and recordings.